Oyster Bay Local 3rd Vice President Guadalupe Johnson and Treasurer Kathy Law, right, explain the many reasons why re-signing a union application offers added security in the workplace. From left, Johnson, Christopher J. Madden and Law. 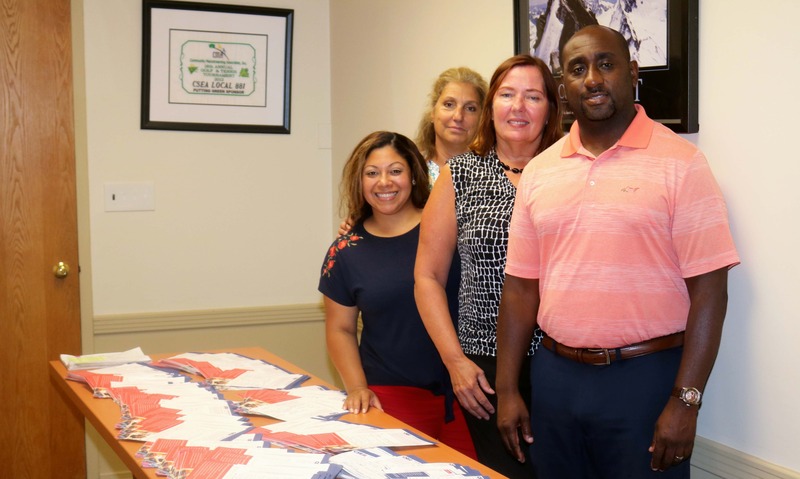 OYSTER BAY — Town of Oyster Bay Local executive board members have been working nonstop at keeping our union strong by asking members to complete membership applications as a way to recommit themselves to CSEA and to show corporate interests groups that their union busting tactics won’t work. Oyster Bay Local President Jarvis Brown, center, speaks with members about the importance of staying union and staying strong at a worksite membership meeting. Local board members spent several months educating members on the details of the Janus case and the advantages of union membership, as well as what members could lose if membership drops. With the consent from Oyster Bay town officials to use town time, the local board held worksite meetings, lasting 20 to 30 minutes, concerning the importance of staying union strong. Oyster Bay Local executive board members display a small portion of the membership applications their local members have signed. From left, local 3rd Vice President Guadalupe Johnson, Treasurer Kathy Law, Executive Vice President Betsy Healey and President Jarvis Brown. Post Janus, the local board’s conversations with our members haven’t changed. Local board members feel that our union must be a 24/7 operation in order to be successful. So, if board members are unable to reach certain members during the day, they go out to speak with them during their free time. Their efforts are working — the majority of local members are sticking with our union.